The Turkmenistan-Afghanistan-Pakistan-India (TAPI) pipeline project has had a slow start. The mega-project, if it ever gets to completion, will yield great benefits to the participating nations and the Central and South Asian region. The TAPI pipeline will transport natural gas from Turkmenistan to the neighboring South Asian region - providing natural gas to Afghanistan, Pakistan, and India. This long-term supply of natural gas will support Afghanistan's energy needs and help rebuild links with neighboring "Silk Road" countries. The project has been delayed numerous times. It is estimated that the pipeline could be operational by 2018. Security Concerns. The pipeline, once constructed, will transport natural gas through some areas still undergoing conflict - the dangerous south of Afghanistan and the Quetta region of Pakistan. These areas are the heartland of the Taliban movement. The pipeline will travel about 735 kilometers through Afghanistan. The overall length will be about 1,600 kilometers - running from the Afghan/Turkmen border to the Pakistan/Indian border. MoMP. The Ministry of Mines and Petroleum is the implementing agency for Afghanistan. The project will generate $500 million USD annually for Afghanistan by way of a transit tax. December 15, 2016. "TAPI: A Transnational Pipe Dream", STATFOR. Until the Taliban and government of Afghanistan arrive at a settlement to end the conflict, building the Afghan section of TAPI is problematic. April 9, 2016. "TAPI Shareholders Sign Agreement to Kick Start Construction". Tolo News. An investment agreement was signed by petroleum ministers and senior government officials from Afghanistan, Turkmenistan, Pakistan and India, as well as senior Asian Development Bank (ADB) officials. March 2, 2016. "Afghanistan Prepares to Start Work on TAPI", Tolo News. December 30, 2015. "The TAPI Pipeline and Paths to Peace in Afghanistan", by Barnett Rubin, The New Yorker. June 25, 2015. "Afghanistan's Pipeline Nears Fruition". By John C. K. Daly, Silk Road Reporters. A detailed update on the TAPI pipeline. March 20, 2015. "A Breakthrough on the TAPI Pipeline?". The Diplomat. Construction could begin as early as 2015. March 18, 2015. "TAPI summit in Kabul tomorrow". Khaama Press. February 27, 2015. "TAPI and India's Future in Eurasia". By Micha'el Tanchum, The Diplomat. This article suggests that India may be marginalized as a result of developments with the TAPI pipeline. November 27, 2014. "TAPI Pipeline Finally Sees Some Momentum". By Casey Michel, The Diplomat. 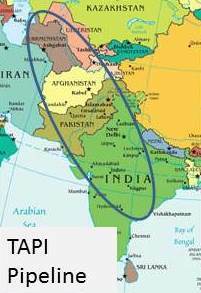 The idea of the TAPI pipeline may soon see some momentum. November 13, 2014. "Turkmenistan, Afghanistan, Pakistan, and India Establish Landmark TAPI Pipeline Company", Asian Development Bank. March 21, 2012. "Collateral Damage from Afghan Turmoil - The TAPI Pipeline", The World Post. This article details the long history of the TAPI pipeline going back to when the pipeline was proposed to the Taliban regime (then in power).